George Washington was born at Bridges Creek (later known as Wakefield) in Westmoreland County, Virginia, on February 22, 1732. His father died when he was eleven years old, and the boy spent the next few years living in different households throughout Virginia. He lived with his mother near Fredericksburg, with relatives in Westmoreland, and with his half brother in Mount Vernon. Not much is known about Washington's childhood. Many American children have heard the story of how the young Washington took a hatchet and cut down a cherry tree, then admitted his deed because his honest character would not allow him to lie. This tale was probably invented by Mason Locke Weems (1759–1825), author of the biography of Washington that appeared the year after his death. At the age of fourteen Washington had planned to join the British navy but then reluctantly stayed home in obedience to his mother's wishes. By the age of sixteen he had obtained a basic education in mathematics, surveying (the process of measuring and plotting land), reading, and the usual subjects of his time. In 1749 Washington was appointed county surveyor, and his experience on the frontier led to his appointment as a major (a military officer who is above a captain) in the Virginia militia (a small military force that is not part of the regular army) in 1752. Washington began to advance in the military ranks during the French and Indian War (1754–63), the American portion of a larger conflict between France and Great Britain over control of overseas territory. In America, this conflict involved a struggle between the two countries over a portion of the Ohio River Valley. Before the war began, Virginia governor Robert Dinwiddie (1693–1770) appointed Washington to warn the French moving into the Ohio Valley against invading English territory. Dinwiddie then made Washington a lieutenant colonel (a military officer who is above a major), with orders to dislodge the French at Pennsylvania's Fort Duquesne, but a strong French force beat the Virginia troops. This conflict triggered the beginning of French and Indian War, and Great Britain dispatched regular troops in 1755 to remove the French by force. Later in the year, Dinwiddie promoted Washington to colonel (a military officer who is above a lieutenant colonel) and made him commander in chief of all Virginia troops. In 1758 he accompanied British troops on the campaign that forced the French to abandon Ft. Duquesne. With the threat of violence removed, Washington married Martha Custis (1731–1802) and returned to his life at Mount Vernon. Washington had inherited local importance from his family. His grandfather and great-grandfather had been justices of the peace, a powerful county position in eighteenth-century Virginia. His father had served as sheriff, church warden, and justice of the peace. His half-brother Lawrence had been a representative in the Virginia legislature from Fairfax County. George Washington's entry into politics was based on an alliance with the family of Lawrence's father-in-law. reversing British policy. In 1774 he joined the call for a meeting of representatives who would define policies for all thirteen colonies, called the Continental Congress, that would take united colonial action against recent laws directed by the British against Massachusetts. 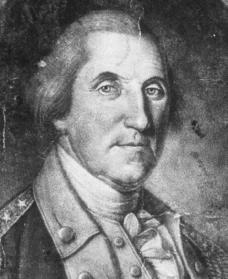 In July 1774 Washington led the county meeting that was held to adopt the Fairfax Resolves, which he had helped write. These resolves (resolutions) influenced the adoption of the Continental Association, a plan devised by the First Continental Congress (1774) for enforcing nonimportation of British goods. They also proposed the creation of a militia company in each county that was not under the control of a British-appointed governor. This idea became the basis of the development of the Continental Army, the united military forces of the American colonies fighting the British. By May 1775 Washington, who headed the Fairfax militia company, had been chosen to command the companies of six other counties. When the Second Continental Congress (1775) met after the battles of Lexington and Concord (the first battles of the Revolution) in Massachusetts, Washington was elected unanimously as commander in chief of all Continental Army forces. From June 15, 1775, until December 23, 1783, he commanded the Continental Army. After the French joined the war on the American side in 1778, it was Washington who headed the combined forces of the United States and France in the War of Independence against Great Britain. Throughout the Revolutionary years Washington developed military leadership, administrative skills, and political sharpness. From 1775 to 1783 he functioned, in effect, as the chief executive of the United States. His wartime experiences gave him a sense of the importance of a unified position among the former colonies. His writings suggested that he favored a strong central government. Washington returned to his estates at Mount Vernon at the end of the Revolution. There was little time for relaxation, as he was kept constantly busy with farming, western land interests, and navigation of the Potomac River. Finally, Washington led the proceedings at the Federal Convention in 1787 that led to ratification, or confirmation, of the new American constitution. The position of president of the United States seemed shaped on the generally held belief that Washington would be the first to occupy the office. In a day when executive power was regarded with suspicion, the constitution established an energetic and independent chief executive. Pierce Butler (1744–1822), one of the Founding Fathers, noted that the Federal Convention would not have made the executive powers so great "had not many of the members cast their eyes toward General Washington as President." After he was unanimously chosen as president in 1789, Washington helped translate the new Constitution into a workable instrument of government. With his support, the Bill of Rights (a written list of basic rights that are guaranteed to all citizens) was added to the Constitution; an energetic executive branch was established in American government; the departments of state, treasury, and war became official parts of the American president's cabinet; the federal court system was begun; and Congress's power to tax was used to raise money to pay the Revolutionary War debt and to establish American credit at home and abroad. As chief executive, Washington consulted his cabinet on public policy. He presided over their differences, especially those between Thomas Jefferson (1743–1826) and Alexander Hamilton (1755–1804). Jefferson and Hamilton represented two opposing sides of an extremely important debate during this time about the role of a strong federal government in governing the former British colonies. Hamilton advocated a strong, centralized federal government, whereas Jefferson, fearing that the executive leader would have too much power, pressed for strong states' rights. Hamilton's position is known as the Federalist position; Jefferson's is known as the anti-Federalist or, later, the Republican position (not to be confused with the present-day Republican political party). Washington approved the Federalist financial program and later, the Hamiltonian proposals, such as funding of the national debt, assumption of the state debts, the establishment of a Bank of the United States, the creation of a national coinage system, and an internal tax on goods. He also presided over the expansion of the federal union from eleven states (North Carolina and Rhode Island ratified [approved] the Constitution after Washington was sworn in as president) to sixteen (Vermont, Kentucky, and Tennessee were admitted between 1791 and 1796). Washington's role as presidential leader was of great importance in winning support for the new government's domestic and foreign policies. Despite his unanimous election, Washington expected that the measures of his administration would meet opposition—and they did. By the end of his first term the American political party system was developing. When he mentioned the possibility of retirement in 1792, both Hamilton and Jefferson agreed that he was "the only man in the United States who possessed the confidence of the whole" country and urged him to continue with a second term. Washington's second term was dominated by foreign-policy considerations. Early in 1793 the French Revolution, which had overthrown the French monarchy in 1789, became the central issue in American politics. France had declared war on Great Britain and appointed Edmond Genet (1763–1834) as minister to the United States. Determined to keep America out of the war and free from European influence, Washington issued a neutrality proclamation (a statement that the United States would not take sides or become involved in the conflict), although the word "neutrality" was not used. Despite the proclamation, Genet supplied French pirates in American ports and organized expeditions against Florida and Louisiana (which were not then part of the United States). For his undiplomatic conduct, the Washington administration requested and obtained his recall to France. In the midst of the Genet affair, Great Britain began a blockade of France and began seizing neutral ships trading with the French West Indies. Besides violating American neutral rights (the territorial rights of a neutral country), the British still held posts in the American Northwest. The Americans claimed that they plotted with the Indians against the United States. In 1794 Washington sent John Jay (1745–1829) to negotiate a settlement of the differences between the British and the Americans. Although Jay's Treaty was vastly unpopular—the British agreed to leave the Northwest posts but made no concessions on other key issues—Washington finally accepted it. The treaty also paved the way for a new treaty with Spain, which had feared an alliance of American and British interests against Spain in the Western Hemisphere. Nearly all observers agree that Washington's eight years as president demonstrated that executive power was completely consistent with the spirit of republican government. The term "republican" here refers to the principles of a republic, a form of government in which citizens have supreme power through elected representatives and in which there is no monarchy (hereditary king or queen). Washington put his reputation on the line in a new office under a new Constitution. He realized that in a republic the executive leader, like all other elected representatives, would have to measure his public acts against public opinion. As military commander during the Revolution, he had seen the importance of administrative skills as a means of building public support of the army. As president, he used the same skills to win support for the new federal government. Despite Washington's dislike of fighting among political "sides," his administrations and policies spurred the beginnings of the first political party system. This ultimately identified Washington with the Federalist party, especially after Jefferson's retirement from the cabinet in 1793. Washington's public service did not end with his retirement from the presidency. During the presidency of John Adams (1735–1826), when America seemed on the brink of a war with France, Adams appointed him commander in chief of the American forces. Washington accepted with the understanding that he would not take field command until troops had been recruited and equipped. Since Adams settled the differences with France by diplomatic negotiations, Washington never assumed actual command. He continued to live at Mount Vernon, where he died on December 14, 1799. At the time of Washington's death, Congress unanimously adopted a resolution to erect a marble monument in the nation's capital in honor of his great military and political accomplishments. The Washington Monument was completed in 1884. Clark, E. Harrison. All Cloudless Glory: The Life of George Washington. Washington, DC: Regnery Publishers, 1995. Emery, Noemie. Washington, A Biography. New York: Putnam, 1976. Ferling, John E. Setting the World Ablaze: Washington, Adams, Jefferson, and the American Revolution. New York: Oxford University Press, 2000. Osborne, Mary Pope. George Washington: Leader of a New Nation. New York: Dial Books for Young Readers, 1991. Rosenburg, John. First in War: George Washington in the American Revolution. Brookfield, CT: Millbrook Press, 1998. JUSTIN, GEORGE WASHINGTON passed away on December 14, 1799. NOSTRADAMUS was born on December 14, 1503. The reason WASHINGTON died on the same date that NOSTRADAMUS was born, is because WASHINGTON was the reincarnation of NOSTRADAMUS. Thank You.